The following statement of principles was prepared by Rob de Santos, Chairman, and based on contributions of Wade Hinkle, co-founder and first President and COO, in order to summarize the ideas and policies that govern AFANA. 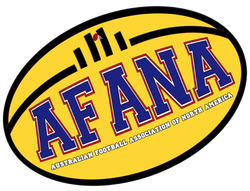 The mission of AFANA remains: "We seek to further the development and exposure of the most exciting game in the world: Australian football, in North America." As part of this mission we seek improved television coverage of the sport, better access to footy news and information, better availability of footy related merchandise, footy exhibitions, footy conventions and tours, and more footy for the fan! We believe anything is possible with the right people and dedicated effort. You, the fan, can take the credit for our success. We, the AFANA officers, are participating in this endeavor for the love of the sport. AFANA Delivers! Early in our history, we worked with the Southern California chapter of AANZA (formerly the AACC) and brought the Grand Final to North American television in 1996 when no TV network would do it. We have worked hard to improve the quality of the TV coverage since that time. We will do what it takes to provide footy for everyone in North America. AFANA's officers are expected to maintain the highest levels of professionalism, ethics, and integrity at all times. Our officers are expected to act in a business-like manner and to obey the law at all times. To the extent practical and possible, we will always be open in our operations. Officers and representatives of AFANA are expected to respect the confidentiality of internal AFANA communications, communications with business partners, and applicable privacy policies, and not to share privileged information with persons not authorized to see such information. Our staff, journalists, and photographers are expected to conduct themselves with the highest levels of professionalism and in accord with commonly accepted standards of journalistic ethics and integrity. As an organization we seek to report with accuracy and respect for our readers and the sport and organizations we cover. AFANA is a marketing partner of marketing partner of MHz Worldview and MHz Networks 1. However, we are editorially and financially independent of any partner. We have content sharing agreements with World Footy News. We have a cooperative relationship with the Australian Football League and associoated entities but we are not an affiilate, financial beneficiary, or subsidiary and are editorially independent. We are the preferred schedule provider for information on AFL matches on television in North America. Beginning with the early stages of the television campaign in 1996, a number of individuals from the United States, Canada, and Australia have been involved to various degrees in the planning and execution of the AFANA mission. With no justifiable reason to exclude anyone, we consider our organization open to members from any country. No one will be denied membership or participation because of their race, creed, color, religion, sexual orientation, marital status, or nation of origin. We respect the privacy of fans, our customers, and members. We have a privacy statement that you may read on this site and our site is P3P compliant. This site has also been positively rated by privacy and child protection organizations such as the ICRA and Safesurf. AFANA believes that to achieve our vision of more footy for the masses all Aussie rules related groups in North America must work together. In particular, we seek a positive, cooperative relationship with all the various playing organizations or leagues. We have not asked for any money expressly for the purpose of conducting, organizing, operating, or managing any club or league of players and teams in Australian football nor have we spent any members' money for such a purpose. We will however, on request, provide whatever technical support we can to any club, team, or league. We will use our resources to help them promote their activities upon request. AFANA is willing to discuss with any other organization our statement of principles at any time. These discussions must take place in private. Any disputes between AFANA and any other organization must be resolved by negotiation and mutual agreement. We prefer arbitration over legal proceedings. AFANA is a legally constituted corporation in the State of Delaware in the United States of America, and is entitled to conduct business in any state, province, or country subject to the laws of that state, province, or country and relevant treaties between same. on behalf of the Board of Directors of AFANA, Inc.